Ever since our first experience with "The Neverending Story" so many years ago, our one goal in life is to jump into a book and ride a gigantic flying dog. There may be no dog, but Final Fantasy Tactics A2: Grimoire of the Rift lets us play out that elementary fantasy with a boy named Luso and a mysterious work of fiction. While waiting for the librarian, Luso flips through the pages and discovers that it ends in the middle. Tagging the tome with his name, Luso is transported to the world of Ivalice with no idea how to get home. When Luso arrives in Ivalice, his clan members teach him the basics, but furthering his Grimoire of the Rift education is entirely up to you. Many role-playing games suffer from a beginning riddled with non-stop talking and tutorials, but Grimoire of the Rift does a good job keeping the dialogue minimal. After the initial battle training sequence you are sent upon your way.To learn more you can visit the pub where all the gossip on quests and combat is available. Visit the "Rumor" tab to see notes regarding all facets of the game. Thankfully, Grimoire of the Rift includes a clan menu where the information is stored after the initial viewing, and you can return for a refresher course as needed. On the downside, unread memos may cause confusion later on. One more important thing to remember is that Luso and his friends are not just sweaty brawlers looking for their next score. Each member of the clan has a roster of careers available, adding yet another level to this endless game. Your career determines the type of weapons and skills you can use to make you a well-rounded killing machine. Due to the small size of the DS screen, however, changes you make regarding armor, weapons and accessories are not shown on your character. We love it when our sword matches the rest of our outfit, so this is somewhat disappointing. After making ourselves over with the latest Ivalice fashions, we led Luso into his first battle. We quickly noticed that playing with the stylus is incredibly awkward, and should be avoided to save your sanity. The tiny plastic pen only moves the cursor and does not select units or actions, so we put it away and charged happily into the fray with our trusty d-pad and four-buttons. In the field, Luso and his clan are up against a multitude of enemies ranging from disgruntled pixies to mutant chickens. Before each battle begins, a judge lists the laws for the fight. Laws can include limitations on active and passive actions. If a law is broken you lose the clan bonus and the ability to revive KO'ed characters. Definitely just a slap on the wrist, so if you're feeling criminal go ahead and take the risk. Grimoire of the Rift offers you roughly 400 quests filled with strategic turn-based combat. Gil, experience, pelts, armor, weapons and more can all be obtained from enemies and completed objectives. Battles may seem to go on forever, but you can break up the brawling by opting for delivery quests. These light adventures often pay better than your average search and destroy mission. Unfortunately, you cannot directly explore any of the environments unless you are engaged in combat. Instead of working your way through the landscape of Ivalice, you move your character around on a small map to each destination. Flags on the map highlight mission locations. When you reach a destination, you are transported to the battle map and must defeat your enemies on a grid floating in space. With all this going on one could easily forget that Luso is still looking for a way home. 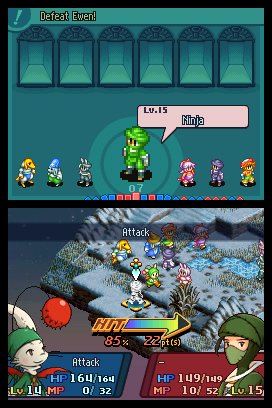 You can follow the storyline at your own pace, choosing to battle for a few days before leading Luso towards his goal. There are so many choices that if you get bored with one thing you can easily find something else to do. Clan trials are one alternative. Available in the pub, these trials affect your group's title, skill and abilities. Accepting a trial uses up the clan points you receive for every completed quest. The points accumulate quickly, however, so there isn't much risk of running out. It is options like this that make Grimoire of the Rift a keeper. Overall, Grimoire of the Rift is an excellent example of quality DS gaming. Good for both at home and on-the-go, the game is sure to be another favorite in the Final Fantasy collection. Now if we could somehow incorporate that dog. What's Hot: Mind-numbing assortment of weapons, armor, jobs and skills. 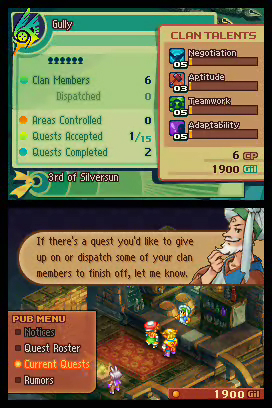 400 different quests. Minimum dialogue and tutorial with an emphasis on self-education. Clan trails. What's Not: Can't see how items look on the characters. Playing with the stylus. Can't freely explore the environment.